This was our first visit to Atlantic Canada–the four Maritime Provinces–and we now understand the appeal. All sorts of wayfarers–interested in food, nature, photography, culture, history, adventure, or family vacations–will find attractions here. New Brunswick, in particular, is compact yet diverse. It’s the only Canadian province to be officially bilingual (French and English, of course), and offers coastline, farmland, forests, dunes. That’s a lot to see, and a lot of chowder to sample! A car is key. We put on about 1500 kilometers (932 miles) in our rented Nissan Micra, starting from Halifax, Nova Scotia, circling around the Bay of Fundy, zigzagging to Fredericton and St. Andrew with a side trip to Grand Manan Island, and returning to Nova Scotia by ferry from Saint John NB to Digby NS. Though that sounds like a lot, the whole drive pleased us with spectacular scenery. Wildflowers in white, purple and yellow brushed the road. Roadside rest areas featured bright Adirondack chairs for viewing. 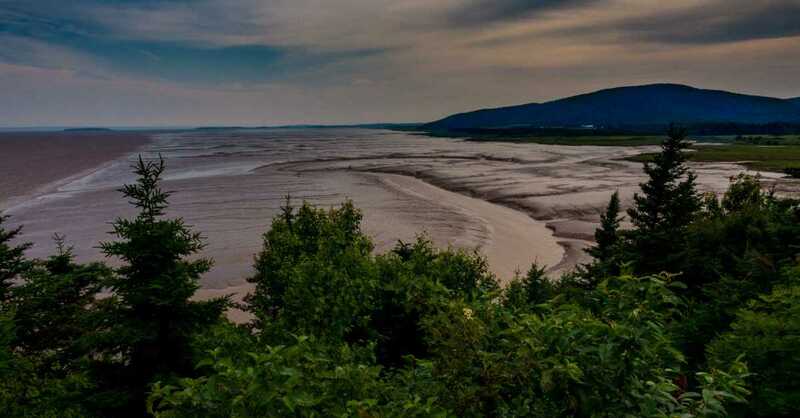 The region’s centerpiece is the Bay of Fundy, known for its extreme tides of 25-50 feet, the highest in the world. 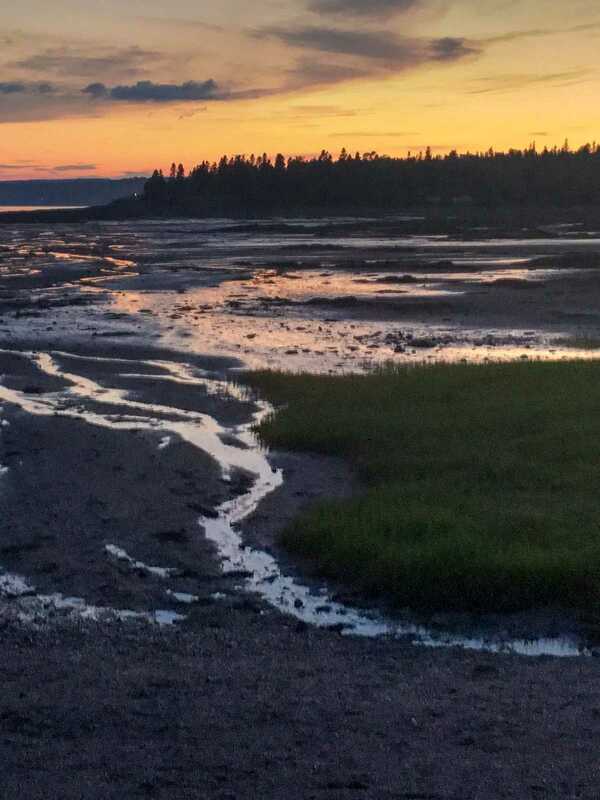 Someone like me can be constantly entertained just observing these tides, and that’s not even counting the whale-watching, migratory birds, interesting geology, and delicious lobster that go along with the Fundy experience. The tides dictate daily life here, including feeding tidal power plants. In spots you can raft on fast changing tides. In Saint John, you can even observe river rapids reversing course twice a day. If you are boating or fishing or just walking the ocean bottom at low tide (and you should try all this), you’ll be well-advised to understand the enormity of the tidal effect. 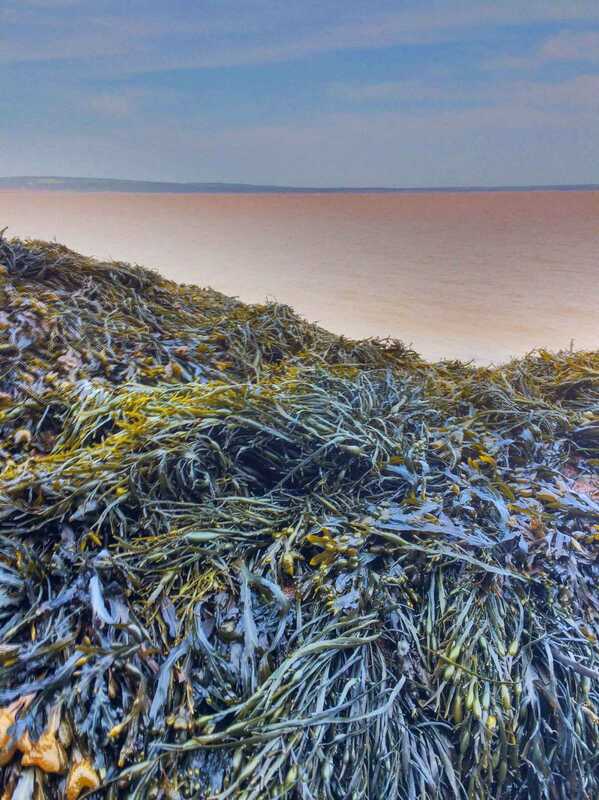 Hopewell Rocks, Bay of Fundy: a rare place offering close-ups of seaweed and the ocean floor twice a day at low tide. 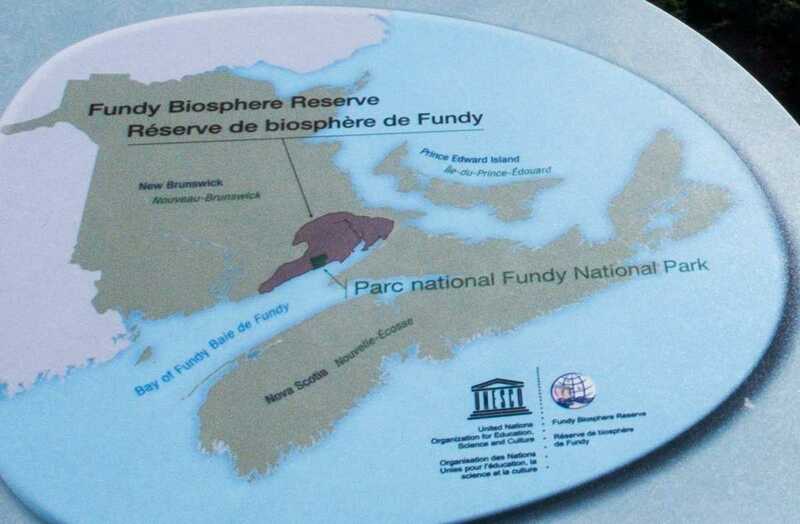 We started our familiarization tour at Fundy National Park, where a UNESCO Biosphere Reserve and the tidal coast combine to attract families, hikers, naturalists, and adventurers. Get your Lob here, hot or cold. The back room includes a huge cold holding pond. 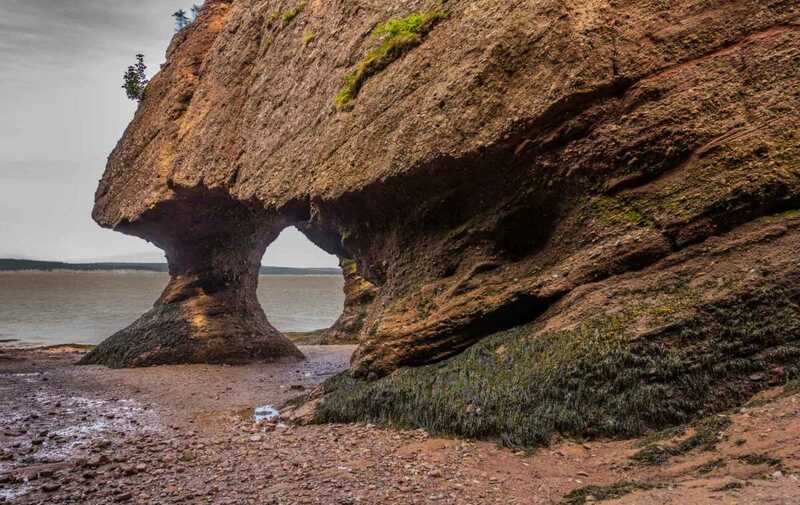 The spectacular Hopewell Rocks are further up the bay, close to its most northerly inlet. This might be the most photographed section of the Bay of Fundy. Not in the National Park system, this provincial venture requires a separate admission fee of $10 Canadian. (Outside of business hours you can walk in sans fees to capture unpeopled dawn or dusk photos.) As advertised, we did “walk on the ocean bottom” at low tide, and found the seaweed covered rocks and packed dunes mesmerizing. With more time or a repeat visit, we’d have gladly taken a kayak out or set up a time lapse photo. Most people visiting this area choose to stay in Moncton, which is sizable enough to provide everything you want including a few good restaurants. The seaside village of Alma is right next to the National Park. Booking late, we ended up in Sussex, between the two, for a little dairy cow town experience. Get to dinner before 8 p.m. or everything will be shut down. Sushi Jo is a good find. From Sussex we drove to Fredericton, the capital of New Brunswick. Arriving on a Friday afternoon, we were able to visit the Beaverbrook Art Gallery and enjoy a walk down main street and back. It’s a short walk, if you get my drift. The enjoyable museum, about to be doubled in size, possibly in time for Canada’s 150th birthday in 2017, offers an eclectic bunch of work mainly by Maritime Canadian artists. Galleries focus primarily on contemporary and early 20th century modern art (with a few 19th century romantic landscapes tossed in). A fun special exhibit featured the cartoon work of Lynn Johnston (“For Better or Worse”) and political art of Michael de Adder. The culinary hot spots of Fredericton are a little limited. Lunar Rogue Pub may appear to be your normal pub with oversized appetizers and burgers, but it also features over 600 single malt whiskeys. Just a block away is Isaac’s Way, a cozy bistro emphasizing fresh and local ingredients. The inventive food comes with ambience: sales of the artwork on the walls goes toward supporting kids’ art camps. Seafood chowder from Isaac’s Way, Fredericton, NB. This version is seasoned with the salty, deep red Dulse, a sea vegetable hand harvested and dried, and sometimes eaten like potato chips. 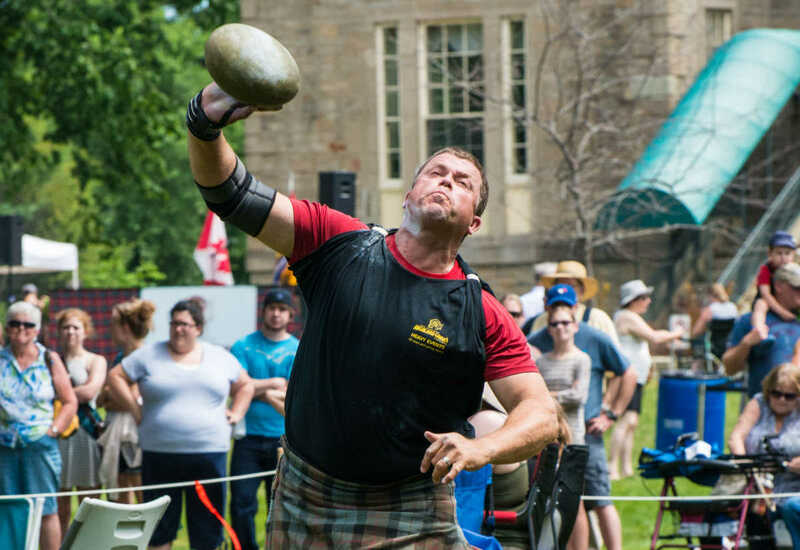 We were lucky to hit the Highland Games Festival in Fredericton, celebrating the close ties between New Brunswick and its Celtic cousins. If you can’t find the fair grounds, follow the kilts and the bagpipes. We spent a fair amount of time watching dudes heaving large rocks and flinging balls on chains across the lawn in the heat of the day, accompanied by a pipe parade and ceremony. If you visit on a weekend devoid of festival, a walk along the river greenway trail would be a good bet. Heaving stones and ball-and-chains under the midday sun. We’d planned to spend a night in St. Andrews, but missed out by booking late. (Again, we should know better, especially in this late July high season.) We found, instead, a place in St. George, where there are precious few food options. Happily the drive to St. Andrews is quick, so we ate there three times. We started with the traditional roadside lunch at The Clam Digger (fish and chips) and returned in the evening for a luscious view of the tide out in front of Niger Reef Tea House (highly recommended). We were back in the morning for a lovely breakfast at Lumberjack Cafe, where the homemade bread selections are plentiful and a view of the harbor from the back porch is charming. This is a busy little town that seems to be benefit from seasonal and expat residents. St. Andrews is about a half hour drive from the US-Canada border crossing (St. Stephens NB and Calais ME). The St. Croix river divides the two countries here. We met up with friends from Maine who led us to a small park on Highway 127 overlooking the river and St. Croix Island, where French explorers including Samuel Champlain wintered in 1604-05, starting some of the first North American settlements. (This international historic site is administered by the U.S. National Park Service. ) We could even see the roof of our friends’ house from here! After a visit to Grand Manan Island (see note below), we passed through Saint John, the largest city in New Brunswick. During an overnight stay, we ate Thai fusion food at Thandi, walked along the waterfront and watched some volleyball league play in front the restaurant area at Market Square, and visited the old city farmer’s market. Our welcome accommodations were at Mahogany Manor Bed and Breakfast, where we did some laundry, met some cheery Canadians at breakfast, and arranged to catch the ferry to Digby, Nova Scotia. With more time, we would have definitely done some kayaking and more hiking, and scheduled a whale-watching trip from Grand Manan. We missed the Acadie area of New Brunswick entirely, but will catch that next time when, presumably, we’ll take the bridge over to Prince Edward Island, too. We have more tips below, but when you plan your trip, check in with the New Brunswick tourism website for up-to-date tips and calendars of events. Near Hopewell Rocks, the Bay of Fundy tidal waters stir up the red sandy bottom, while piles of seaweed show yellows and blue greens under the sun. 2017 free admission to Canada’s National Parks. We decided to buy an annual Discovery Pass for Canada’s National Parks (CA $68). In 2017, all of Canada’s national parks and historic sites will be free, commemorating the country’s sesquicentennial. So our pass will jump the free year and is valid until July 2018. Nice! Grand Manan Island The island deserves a post of its own, with its rich history, idiosyncratic islanders, fishing and shipping culture. Grand Manan is right at the entrance to Fundy bay. It’s also the jumping off point for world-renowned whale watching (some dozen varieties including humpback) and bird spotting (puffins in season). We spent two nights (and devoured two spectacular breakfasts) at SeaCup Inn, and wanted weeks if not months more. Our Grand Manan Island post will follow. Fredericton Boyce Farmers Market This 60-year-old market is an entertaining center of social activity, artisan goods and, of course, fresh fish, local cheeses, and a good cup of coffee. Octopus’ Garden Cafe, Alma. Every now and then you may want something other than lobster. This Italian oriented restaurant fits the bill. Upbeat and friendly service from the Argentinian server to the chef who steps out to make sure everyone is happy. Baked goods at Fredericton’s Farmers Market. 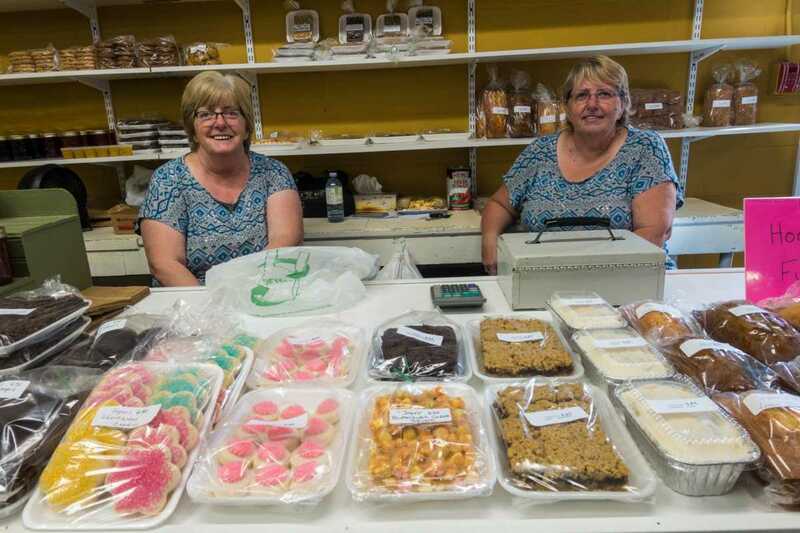 Joyce and Brenda are sisters, but they didn’t mean to show up for market day wearing the same shirts. Love your photos, especially the baked goods sisters :). 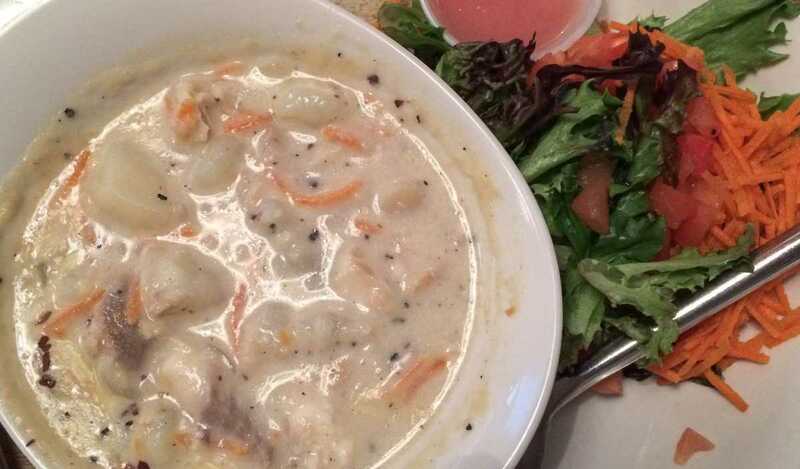 We had a trip to the region a few years ago, and the clam chowder we had at a little cafe in New Brunswick near the Confederation Bridge is still legendary in our minds. Duly noted! I noticed a “Chowder Trail” promotion which offered a guide to dozens of spots. It serves as a passport, and after so many chowder stamps, users are eligible for prizes. Chow down! I love the idea of the “next time folder.” If you only knew how many times I went to a place just to discover that whatever amount of time I allocated to visiting it is barely enough to just give me an idea about it. I never visited New Brunswick but judging from you beautiful photos I understand why you feel frustrated. A week in such a place is way too little. First, awesome pictures! Being Canadian, I know I should get out to the east coast and you definitely confirmed this. Lucky you for getting such great lobster! (I would dip it in butter too!) You certainly saw a lot in one week and I love how you did a whole variety of things. That makes a trip so much more memorable. That a lot of mileage you covered but I’m sure you felt it was worth it. I’m surprised more people don’t include the Bay of Fundy in their Wanna Travel list. It’s pretty amazing. I’ve never been to the Canadian Maritime provinces either which is inexcusable given that I live in the northeastern United States. Not that the writing isn’t splendid, but your (Tom’s?) photos prove that a picture is worth a thousand words. Some by me, some by Kris. She has quite an eye, really. Beautiful photos, beautiful place. Thanks for sharing. I’m part Canadian, but I’ve never been up there. Guess I should plan a trip up north. Thanks, Lawrence. Sounds like you are due to return to your homeland…. 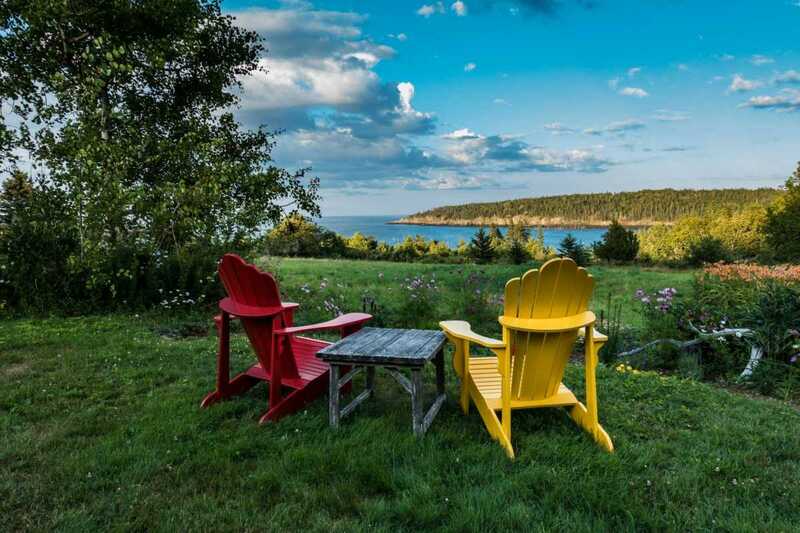 It would be great fun to find a good Adirondack chair in a key position, load up a picnic basket and shoot periodic photos while the tide goes out and in. Both New Brunswick and Nova Scotia seem to be effective in starting to spread the word. I’m guessing they are targeting Eastern U.S. more than Western Canada, and maybe that is due to accessibility. We thought of driving from Minnesota, but just didn’t have the time. We flew Air Canada MSP-YHZ for about $650 each. Not cheap. Thank you for the glowing review of my home province! NB has often been noted as the ‘drive through’ province, for people travelling to or from NS, PEI and Maine. For those of us who call it home we know what people are missing by not getting off the Hwy to explore the diverse and spectacular beauty! I think our Tourism dept are working hard to spread the word as you say! Happy to hear you will be back! ? Well said, Monica! 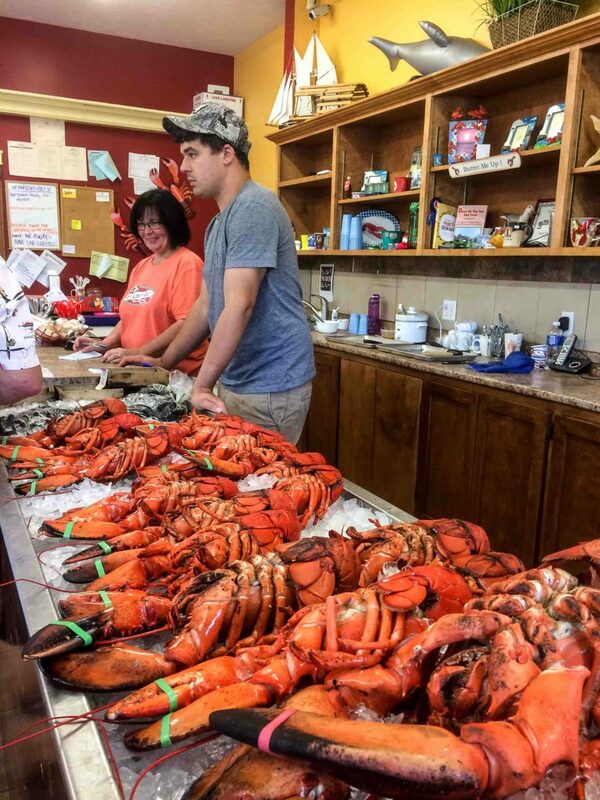 There are lots of reasons and ways to make NB the ultimate destination.